When search engine employees appear on panels at SEO/SEM conferences, they’re usually hamstrung by company PR regulations about what they’re allowed to say. And usually, they’re not allowed to say much. There are exceptions, of course, but one of the more common phrases you’ll hear from SE reps is “I can’t say anything more than that.” It’s great that they attend, but it stinks that they often can’t answer questions. There was an exception to this during SMX West: The “Local Search & Blended Results” session on day one. Google didn’t have a rep there, but Brian Gill of Yahoo! and Kevin Hagwell of MSN Live Search both answered the crowd’s questions more fully than I expected. Reviews and ratings have no impact on reaching those top three spots in the regular SERPs. Innaresting, isn’t it? The above screenshot seems to prove it right: The top-listed business has zero reviews, but has the keyword in its business name and is located close to the city centroid. The second business has a good location to go along with all those reviews. The third business has a terrible location — far away from the city centroid — but has the keyword in its name. Brian also told the crowd that your business’s local category is a very important piece of the local SEO puzzle. I didn’t check categories on those three results (this isn’t a scientific study!). That local session was easily my favorite of the week, but there were several other good ones, too. I spoke with one gentlemen who works for a national retailer and is just getting into search marketing; he told me he found the conference excellent, and planned to get other people at his company to attend in the future. Whoa, okay, that IS news, Matt. I really appreciate you sharing that takeaway with us. I want to be sure I’m understanding that correctly. Yahoo’s Shortcut, their top 3 in the organic SERPs, is influenced by centroid, etc, but not by UGC. However, when one is WITHIN Yahoo Local, UGC DOES determine rankings? Yes? Do I have that right? The Yahoo rep never specifically mentioned centroid when talking about the Yahoo Shortcut “3-pack”, but he did specifically say that reviews/ratings had no impact on the 3 businesses that appear there. And he said the reviews/ratings are only factored in once you get into Yahoo Local. 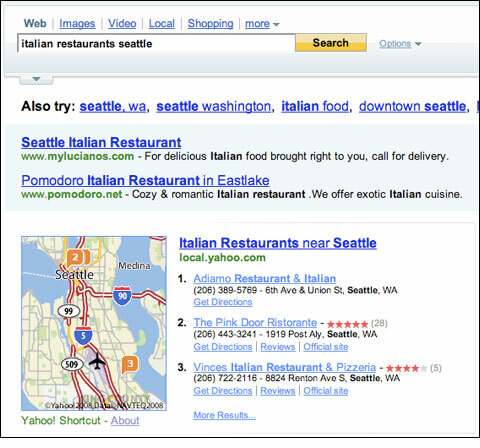 I mentioned centroid only in my own quick analysis of the three businesses appearing for “italian restaurants seattle”. Thanks for moderating the Q&A on that session Matt. Being my first panel, I was certainly nervous — but hope that attendees were able to take away some solid information. I had come to the exact opposite conclusion when I did a search for Pizza Paramus NJ. I concur, Eric’s post is well worth the read – hi Eric! Matt, yes, that helps. This really is weird news. Like Tim, I did not know this worked this way, and had always thought the opposite. You are very cool for finding this out, by the way, Matt.